A heavy barrage of rockets was fired at Israel's south Tuesday morning as reports about an imminent ceasefire continued to surface. 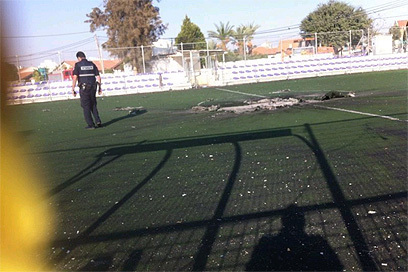 An Armored Corps reserve officer was moderately injured by a barrage of 13 rockets and mortar shells fired at the Eshkol Regional Council. 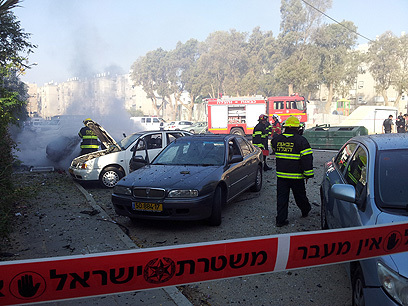 At around 10:30 a Grad hit a building in Beersheba. Since 7:30 am, some 18 rockets were fired at Beersheba, of which the the Iron Dome intercepted at least 12. 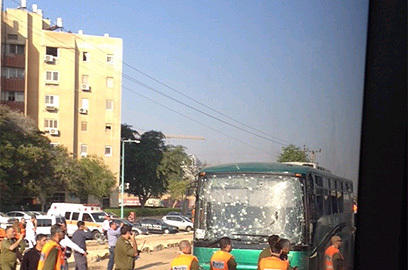 A building suffered a direct hit, one rocket hit a traffic island and caused damage to a bus, and a third rocket hit a car and caused damage to cars and buildings in the area. The remaining rockets landed in open areas. 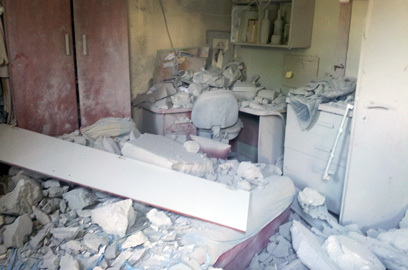 No injuries were reported but 10 people suffered from anxiety and were taken to the Soroka Medical Center in Beersheba. The Iron Dome system also intercepted two rockets fired at Ashdod and Gan Yavne. 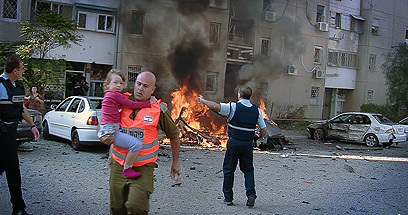 At around 9:20 two rockets exploded in open areas in Sderot. 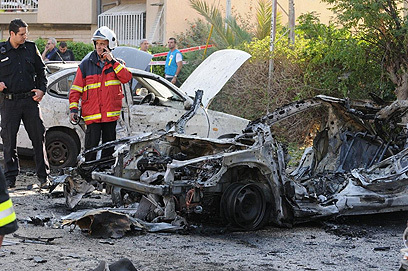 Another rocket hit a parking lot in the Eshkol Regional Council. No injuries or damage were reported. The forum of nine leading ministers convened Monday night to discuss the Egyptian proposal for a ceasefire that would end Operation Pillar of Defense against terrorists in Gaza. Israel has agreed not to launch a ground offensive until the negotiations are exhausted. The meeting ended at 4 am but no official statement has been issued. 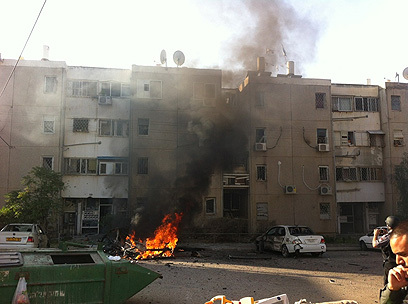 Meanwhile, the Palestinian Maan news agency reported that Air Force jets attacked the Islamic Bank in Gaza. It was also reported that three missiles were fired at the home of the Rafah Brigade commander in Hamas' military wing, Raed al-Atar as well as the home of another high rankling operative in the group. The IDF Spokesperson's Unit said it struck some 100 terror targets overnight including hidden rocket launchers, terror tunnels and arms depots. 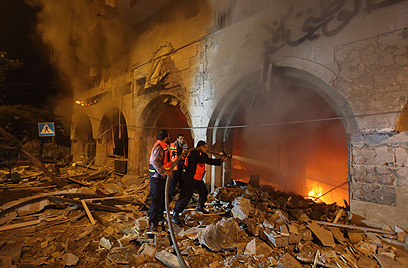 Buildings belonging to several high ranking terrorist operatives in Gaza were also hit according to the IDF. Also Tuesday, al-Arabiya reported that Israel and the Palestinian factions are expected to sign a ceasefire agreement within a matter of hours. It was also reported that preparations for the signing are already underway in Cairo. The report could not be confirmed by any other source. According to al-Arabiya, Israel asked Egypt to play the role of mediator during a 24-48- hour ceasefire before the final agreement is signed. Sources told the network that the agreement includes the lifting of the Gaza blockade and the opening of various crossings. Egyptian President Mohammed Morsi will vouch for the deal. An Israeli state official said Tuesday that the "IDF will continue to act with force in the Gaza Strip. Before deciding about a ground invasion (Prime Minister) Netanyahu intends to exhaust the diplomatic route in order to explore the possibility of a prolonged ceasefire." Prime Minister Benjamin Netanyahu will meet with the German foreign minister and other world leaders on Tuesday. "Israel intends to achieve its goals without a ground offensive but if the way to protecting Israeli citizens is through a land invasion – that's what we'll do." 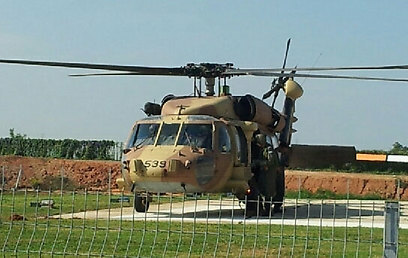 See all talkbacks "Reserve officer wounded in Eshkol"